i didn't quite see the connection at the time, and now that i've visually seen the connection, i'm not altogether sure it makes sense. it was a bit of luck really; if i hadn't bumped into joanne at debbie's, by now i'd have been kicking myself. however, after phoning ardbeg distillery, we got our times sorted out for monday morning, and with continuing sunshine and blue skies, there wasn't much need of any other excuse to go for a bike ride both there and back. whatever else orange county new york is famous for, if you've clicked onto the discovery channel every now and again, you may have seen the teutel's family arguments raging across the tv screen, as they distract themselves from building some quite phenomenal motorbikes. and not just any motorbikes, but those machines with considerably extended front forks: orange county choppers. i have no particular interest in motorbikes per se, but i have on occasion marvelled at the ingenuity of father and sons when engineering and decorating these wholly impractical machines. they might not be propelled by pedals, but credit where credit's due. in 2010, ardbeg distillery had orange county choppers build two machines that would represent the brand at the various whisky expos that are held all across north america. 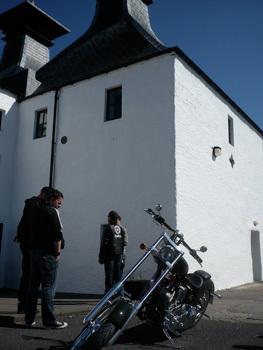 according to hamish torrie and alan little of glenmorangie (ardbeg's parent company), the choppers were well received wherever they went, apparently cementing the connection between ardbeg's amber nectar and the imagery that a fabulously decorated and vastly expensive motorbike concocts in the first place. like i said in my opening statement, i don't quite see the connection. both american ardbeg orange county choppers have now moved onto new owners; one was auctioned, i believe, and the other was purchased by an appropriately fanatical gentleman with a penchant for ardbeg and occ. however, somewhere, at sometime, somebody seems to have considered the european contingent. after all, the distillery isn't that far away from scotland, and at the end of this month, when the islay whisky festival obliterates any spare standing room the island might have, a sizable proportion of mainland europe will temporarily move in. it seems only fair that they be provided with at least a glimpse of the orange county chopper. of course, the vagaries of marketing don't always match up with real events, and it appears that the ardbeg chopper will be in mainland europe when most of mainland europe is here. that's not my problem, however; i am simply required to observe and, perhaps, comment. 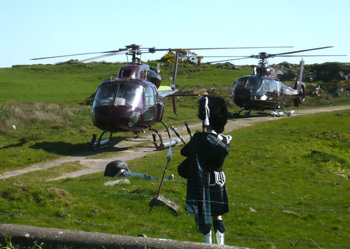 with the helicopters populated by european journalists due for arrival at the distillery around 10:30am, manager mickey heads said i should get there around 10. despite a bright and shiny day, in the true spirit of manana that pervades much of island life, the flying choppers landed almost half-an-hour late. following coffee and scone, jam and clotted cream, it was time for the obligatory tour of the distillery, ending with a tasting of three expressions of ardbeg midst thousands of casks in warehouse one. as a confirmed teetotaller, i yet again provided a modest degree of hilarity by politely refusing any of the three. whisky rhetoric is well over the top, particularly when espoused by the head of marketing and the company's master blender. during lunch, we were introduced to justin, the chopper's pilot for its brief stay, a slim cool dude from texas with a ponytail and facial hair; not at all the overweight hairy biker that i'd have placed as the archetype on such a bike. but i still don't quite grasp the connection between a scotch single malt whisky and an oversized motorbike. no matter; the visit to the distillery, a perfect lunch aside, was somewhat of a means to an end rather than an end in itself, for my own transportational needs were to be taken care of first. i currently have, squashed into the bikeshed alongside a veritable panoply of bicycles, a traitor luggernaut, the full test of which will appear on the post later this week. however, it is powered by three hub gears from sturmey archer, providing the opportunity for a sedate rumble along the low road and out to the furthest south of islay's distilleries. with the flexibility and mother of invention that comes with being a do-it-yourself bike reviewer, i'd removed the campagnolo quill pedals from the sturmey cranks, and replaced them with a pair of crank brothers eggbeaters. 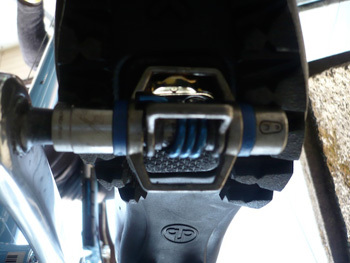 eggbeaters need cleats, and cleats need shoes capable of being attached to same. however, if you have comprehended any of the above, i hope i may have impressed that, despite ardbeg being the most laid back of establishments, a certain sartorial decorum would not go amiss when mixing with the hoi polloi of european journalism. that decorum starts with the shoes, in this case, a brand new pair of quoc pham, tan leather touring shoes with their contemporary looks and chunky, solid soles. having adopted the persona of urban warrior for the day, too cool for fixed, and entirely bereft of lycra, i popped helmet, gloves and cap in the manager's office, and could easily have passed for a regular member of the human race. mind you, i would be guilty of a falsehood if i were to direct you that this was the shoes' first outing. i had already partaken of a perambulatory excursion a few days previously, culminating in the inevitable coffee stop. yet again, i was able to blend in with society. the word touring brings with it certain implications, not least of which is that of a distance in excess of either outing on my island home. but it also impresses slow, steady motion, able to soak in the atmosphere, the sights and sounds, and whether those feet are as comfortable as they need to be. having benefitted from the luxury that is several leather saddles, i have no need of convincing of the material benefits to be gained thereof. get the size right in the first place, and continued, regular use, coupled with a soupcon of tender loving care will see such footwear not only grow old with dignity, but mould themselves to the awkwardness that is my feet. the same opportunities are available to all. the chunky soles guard those small metal cleats with a vengeance and provide a stiffness that is necessary when feet are clicked into a pair of eggbeaters. 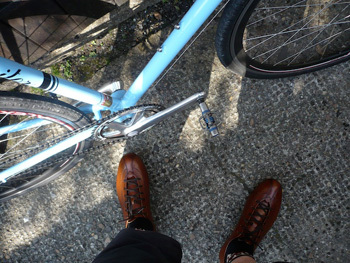 this is not to cast aspersions upon the pedals, for they are excellent at their job, but in a rather minimalist manner, leaving little in the way of support for a large proportion of the shoes. it is then a case of balancing the rigidity of the sole with enough flexibility to allow some comfort. touring, of course, also carries with it the need to walk about a bit, either across fields, supermarket floors, bed and breakfast carpets, the pavements bordering our streets and the dark and mysterious inner sanctum of a single malt distillery. unlike car production lines, distilleries are not arranged in a straight line, nor all on the same level. so having clambered over hoof-marked grass meeting the helicopters, up stairs to the malt bins, wandered past the grist mill, up to the mash room, across to the oregon pine washbacks and down to the still room without so much as the fear of a slip, nor managing to cleat myself into the open grate flooring, before emerging at the spirit safe with a healthy degree of composure, i'm sufficiently convinced. these are touring shoes in pretty much every way i can think of. tuesday eve is now port mor wheelers eve, when mr hastings and i tried our level best to lead the kids on a wild goose chase through the maze of tracks surrounding the grounds of islay house. yes, ok, i fell off once, but only because of incompetence, and some very muddy obstacles hastened membership of the association of wimps, necessitating some cyclocross carrying through the undergrowth bordering the squidge. on return to washingmachinepost cottage, you'd have thought the shoes had only just been removed from their box. quoc has made a thoroughly excellent shoe; i know how long he's been working on this particular model, and every month has been worth the wait. if you're in the market for a highly competent and stylish pair of spd compatible shoes, he may have solved your problem. 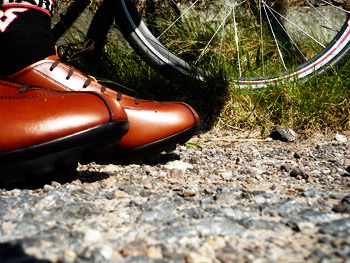 the quoc pham tourer is available in brown, black and tan, sizes from 41 to 47 at a cost of £149.95 per pair.